AS OF FEBRUARY, 2019, THE ORMSBY REVIEW HAS ATTRACTED MORE THAN 330 HIGHLY QUALIFIED CONTRIBUTORS. BCBookLook was envisioned in 2012, designed in 2013 and launched in 2014. With more than 2,700 original postings, the site has attracted more than two million visitors. The popularity and viability of this service to support books and authors of British Columbia was hugely boosted by the creation of The Ormsby Review, a vehicle for book reviews and articles of any length, usually extensively illustrated, as of September 2016, as Phase One of development for The Ormsby Review. It is envisioned that The Ormsby Review can become an independent operation, under the direction of Richard Mackie, during Phase Two of its development, as originating publisher Alan Twigg considers retirement. Meanwhile, anyone who spends five minutes grazing this omnibust BCBookLook site will discover it’s a news service that presents original articles, reviews and news on events, films, videos and audio interviews, as well as a BCBookAwards information hub (on most of the major B.C. literary prizes) and the enormous Literary Map of B.C. (the equivalent of nine books). As well, this site provides electronic access to the B.C. BookWorld newspaper, including back issues, and it’s linked to the ABCBookWorld reference site that affords free literary information for and about more than 11,800 B.C. authors. Plus it’s home to the new Ormsby Review, a venture to double the number of serious book reviews in British Columbia. As an unfunded project started in mid-September of 2016, co-managed by Alan Twigg on a volunteer basis, along with Richard Mackie, former reviews editor of BC Studies, The Ormsby Review has radically increased the depth of coverage for books and essays pertaining to British Columbia. After repeated efforts to receive provincial recognition fell on deaf ears, ABCBookWorld was likewise built entirely on volunteer labour from 2001 to 2014. We like to err on the side of content. We don’t cut ‘n’ paste stuff from other websites; we make the content that other websites cut ‘n’ paste. Similar to the B.C. BookWorld newspaper that began in 1987, our goal on the internet is to provide as much useful information as possible, about as many B.C. books and authors as possible, to as many people as possible, on a daily basis. Together, the BCBookLook news service and the ABCBookWorld reference service have eclipsed 4,000 visitors per day (stats available). With millions of people using these services, we easily serve more people than all the writers festivals in Canada combined. With zero federal funding. There is absolutely no plan to discontinue the B.C. BookWorld newspaper because it is as popular as ever. It was expanded in 2015 to 44 pages per issue and remains that size. We believe the hard copy newspaper, available via more than 650 outlets around B.C., still triumphs as the most important cog in the infrastructure that supports B.C. publishers and authors. Simon Fraser University Library serves as the essential host for the aforementioned digital platforms. 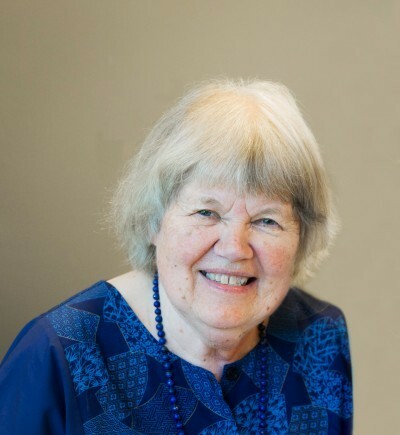 We remain grateful to SFU Library’s Lynn Copeland for giving us the green light on the original ABCBookWorld project in 2003, followed by her successor at SFU Library, Chuck Eckman; now capably followed by his successor, Gwen Bird. Siavish Miri of SFU Library re-engineered the ABCBookWorld site for us in 2008 after Todd Holbrook had laid the technical foundations for our original BC Author Bank in 2003. The site was “re-simplified” with the assistance of Martin Twigg and Andre Liem in 2009. It underwent a major refit in 2016-2017 when SFU Library decided, mainly for internal security reasons, that all content must be migrated to a WordPress site. The implementation process for BCBookLook was similarly collaborative and pleasant, starting with the collective input of Monique Sherrett of Boxcar Marketing and her students at the Canadian Centre for Studies in Publishing (Rowland Lorimer, director). Subsequently, Christine Rondeau of Bluelime Media and SFU programmer Marcus Barnes worked in concert with designer David Lester and Get To The Point Graphics, and Sharon Jackson of Jackson on The Moon. I am most indebted to my colleague David Lester with whom I’ve worked continuously since January of 1988. Some of the personnel responsible for providing content and administration have included Writer/Editor Sophie Blom, Writer/Editor Angela Caravan, Writer/Editor David Conn; Contributing Editors Anne Cameron (more than 80 columns for Western Edge), Jane Watt, Paul Durras, Jaiden Dembo, James Paley, Beverly Cramp; Filmmakers Tom Shandel, Glynis Whiting, Ken Hewlett / Designer Christine Rondeau / Photographer Laura Sawchuk / Technicians Marcus Barnes, Kenneth Li / Accountant Anna Wu / Bookkeepers Elaine Keating and Ingela Kasparitis / Designer/Site Manager for BCBookAwards and Literary Map of BC Sharon Jackson. Combined provincial and federal support for the ABCBookWorld service was zero from 2001 to mid-2014. Proposals to the B.C. Arts Council for help creating BCBookLook were rejected three times. Eventually Canada Council provided crucial, one-time support for the construction phase of BCBookLook in 2013–but nothing since. After B.C. Arts Council failed to respond to four letters asking for a meeting, dating back to 2010, creativeBC [now Creative BC] came forward to provide some essential support for the twin website initiatives in 2014. Canada Book Fund also contributed essential funding in 2014 for the creation and integration of videos for and about B.C. authors. We attained one-time funding support for the Literary Map of B.C. initiative from the Arts Innovative Fund of B.C. The combined sites of ABCBookWorld and BCBookLook had more than six million page views in 2014, the first year of mutual operation. The manners, civility and cooperation of the Canada Council were consistently exemplary when we started operating B.C. BookWorld under the umbrella of Pacific BookWorld News Society in 1988, but Canada Council has lately fallen behind in terms of recognizing a variety of initiatives undertaken in recent years. In a nutshell: the funding level from Canada Council since the 20th century — between 2000 and 2019 — has not changed despite the fact that we have added ABCBookWorld, BCBookLook, Literary Map of BC, BCBookAwards and The Ormsby Review during this period. For a while we were naively hopeful B.C. funding might rise to even half the amount that Ontario provides for less effective sites but that remains wishful thinking. In its first 150 days of existence, The Ormsby Review instigated 160 reviews and essays–entirely without funding–and attracted more than 200 expert contributors in its first year of existence. As of February of 2019, there were almost 500 reviews and more than 300 contributors. 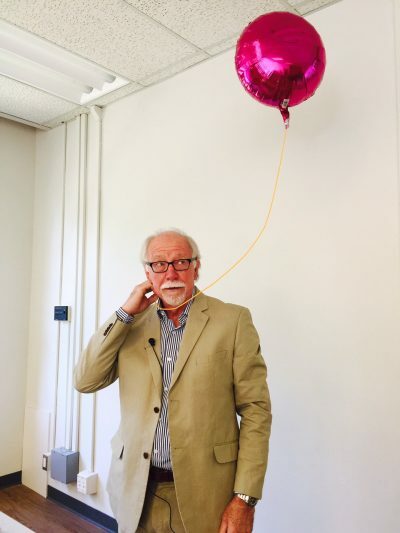 Richard Mackie, as the main reviews coordinator, now receives a modest salary, via B.C. BookWorld, but evidently serving the general public with serious book reviews is no longer a priority in some government agencies. If you’re a B.C. author who has just published a new book, and you already have an entry on ABCBookWorld reference site, please let us know the title, publisher and year of your recent publication so we can augment your entry. Non-self-promotional language is required for all submissions. You’re welcome to take a $25 subscription to B.C. BookWorld to support our labours in the process, but it’s not mandatory. New authors pertaining to British Columbia are invited to submit biographical information, along with factual information about their books–keeping promotional language to a minimum. We are gatekeepers of book knowledge. We reserve the right to edit or restrict materials submitted to ABCBookWorld or BCBookLook, limiting puffery, endorsements written by friends and the name of your cat. And don’t forget to send along a Jpeg headshot of your yourself, limiting the size of the file. In compiling these sites, we are continually correcting inadvertent errors made by those who came before us. It’s logical, given the plethora of dates and odd spellings of names, we’ll occasionally present some inaccuracies, too. Please let us know if you find any error, even a tiny one. Making literary history is a cumulative process so we cannot take full responsibility for every sentence; but, like Wikipedia (started in 2001, when we started ABCBookWorld), we do our damnedest to get it right. The Publisher produces several print and online publications including BC BookWorld, BC BookLook, Ormsby Review and ABCBookWorld. To do such things which are incidental to, and in furtherance of, the undertakings of the Publisher. The Publisher is proud of its publications both print and online, its charitable projects such as The Literary Map of BC, the George Ryga Award for Social Awareness in Literature and the George Woodcock Lifetime Achievement Award; and its comprehensive data base for BC literature, ABCBookWorld; and other activities which promote writers and writing in BC. All allegations of discrimination and/or harassment against employees of the Publisher, volunteers performing services for the publisher, and writers on assignment for the Publisher will be investigated and appropriate action will be taken. Without limiting the generality of the foregoing, employees, freelance contractors or volunteers may be asked to resign, may be placed on temporary leave pending further investigation and/or may be dismissed from their positions. Without limiting the generality of the foregoing, contributors may have their submissions placed in abeyance pending further investigation and/or withdrawn. The dignity of all individuals is important to us. We will not tolerate or condone any form of discrimination and/or harassment, and we will not ignore any allegations of discrimination and/or harassment brought to our attention. As we have been doing for more than thirty years, we will continue our steadfast support for, and enhancement of, unprivileged and disadvantaged members of society, while writing and publishing on unceded lands of the xʷməθkʷəy̓əm (Musqueam), Skxwú7mesh (Squamish) & səlil̓wətaʔɬ (Tsleil-Waututh). We acknowledge the financial support of the Government of Canada through the Canada Book Fund (CBF) for the instigation of the BCBookLook project. Provincially, we would not be able to continue operations without the essential partnership of Creative BC. The Society has served as the advisory, umbrella organization for the educational newspaper BC BookWorld, published for the Society by A.R.T. BookWorld Productions Inc. since 1988. It has also engendered a reference site—eleven years in the making, and unfunded during that time—for more than 10,800 B.C. authors and their books. Hosted by Simon Fraser University, it is the most extensive, original promotional site for authors in Canada, including thousands of photos and an ever-expanding archive of essays, interviews and profiles. The BookWorld staff has also co-created and/or managed most of the province’s major literary awards including the BC Book Prizes, the George Woodcock Lifetime Achievement Award, the Vancity Women’s Book Prize and the George Ryga Award for Social Awareness. For several years staff also provided free administration for the City of Vancouver Book Award. All such administration for ancillary literary support activities—eg. the ABCBookWorld reference site, management of literary prizes and organization of the Reckoning 07 conference at Simon Fraser University—has been provided on a volunteer basis. As well, the publisher of B.C. BookWorld served a two-year term as an unpaid Vancouver Public Library Trustee in 2011-2012. Pacific BookWorld board members include Howard White (president), publisher of the Encyclopedia of British Columbia; UBC historian Jean Barman, author of The West Beyond the West; author and teacher Andreas Schroeder, co-founder of Public Lending Right in Canada; Dr. Rowland Lorimer, co-founder for the Canadian Centre for Studies in Publishing; former Vancouver Public Library chief librarian Paul Whitney; current Vancouver Public Library chief librarian Sandra Singh; SFU Chief Librarian Gwen Bird, UBC librarian Brenda Peterson and former CBC Radio host and author Mark Forsythe. Since 1988, the permanent staff of two has consisted of David Lester and Alan Twigg. Over the years, staff of B.C. BookWorld has jointly produced six books outlining the literary history of the province, culminating in The Essentials: 150 Great B.C. Books & Authors (Ronsdale, 2010), the first critical overview of British Columbia literature. 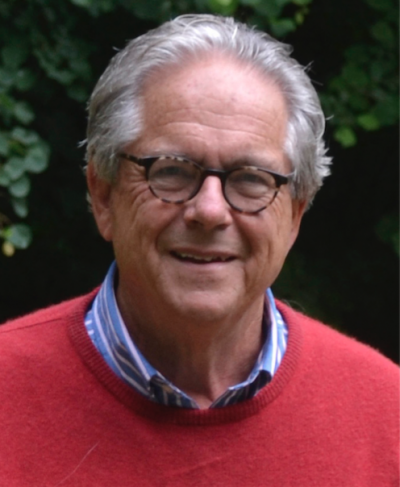 We are pleased to add Ormsby Review books editor/writer Richard Mackie; and, as freelancers, ABCBookWorld & BCBookLook editor/writer Beverly Cramp and webmaster Sharon Jackson to our team. 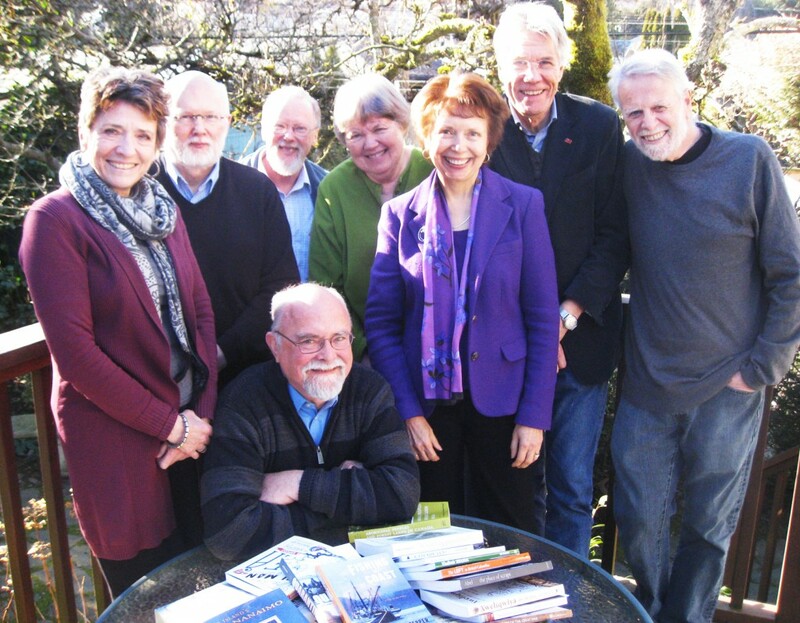 Pacific BookWorld News Society president Howard White surrounded by 2015 board members Margaret Reynolds, Eric Swanick, Andreas Schroeder, Jean Barman, Brenda Peterson, Rowland Lorimer, Paul Whitney. James Hall: Wow, that looks great! That is really visually appealing, kudos to you and your colleagues. 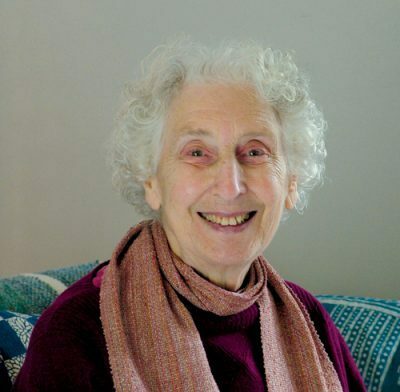 Louise Mandell: Congratulations on The Ormsby Review—a great addition. Ron Dart: The Ormsby Review is desperately needed to fill an immense chasm in literate B.C. history. David Mattison: “Wow, this is surprising news. Congratulations. I’m happy to assist you as a reviewer in your new venture and thank you for thinking of me. I first started reviewing books in 1976, so it’s an auspicious year to start reviewing for a new publication. Ian Kennedy: I am also delighted to hopefully gain a place in the Ormsby Review. I was a student of Margaret Ormsby while at UBC and visited her and drank sherry in her home in Vernon with my editor and friend Gordon Elliott when we were touring BC “researching” our Pub Book. Gordon worked on her History of BC and on the Anthology in the years leading up to 1958 when they were published.